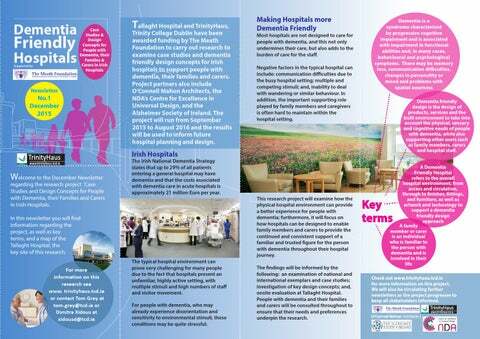 Trinity College Dublin have been awarded funding by The Meath Foundation to carry out research to examine case studies and dementia friendly design concepts for Irish hospitals to support people with dementia, their families and carers. Project partners also include Oâ&#x20AC;&#x2122;Connell Mahon Architects, the NDAâ&#x20AC;&#x2122;s Centre for Excellence in Universal Design, and the Alzheimer Society of Ireland. The project will run from September 2015 to August 2016 and the results will be used to inform future hospital planning and design. Most hospitals are not designed to care for people with dementia, and this not only undermines their care, but also adds to the burden of care for the staff. Negative factors in the typical hospital can include: communication difficulties due to the busy hospital setting; multiple and competing stimuli; and, inability to deal with wandering or similar behaviour. In addition, the important supporting role played by family members and caregivers is often hard to maintain within the hospital setting. Dementia is a syndrome characterised by progressive cognitive impairment and is associated with impairment in functional abilities and, in many cases, behavioural and psychologitcal symptoms. There may be memory loss, communication difficulties, changes in personality or mood and problems with spatial awarness Dementia friendly design is the design of products, services and the built environment to take into account the physical, sensory and cognitive needs of people with dementia, while also supporting other users such as family members, carers and hospital staff. regarding the research project â&#x20AC;&#x2DC;Case Studies and Design Concepts for People with Dementia, their Families and Carers in Irish Hospitals. The Irish National Dementia Strategy states that up to 29% of all patients entering a general hospital may have dementia and that the costs associated with dementia care in acute hospitals is approximately 21 million Euro per year. The typical hospital environment can prove very challenging for many people due to the fact that hospitals present an unfamiliar, highly active setting, with multiple stimuli and high numbers of staff and visitor movement. For people with dementia, who may already experience disorientation and sensitivity to environmental stimuli, these conditions may be quite stressful. This research project will examine how the physical hospital environment can provide a better experience for people with dementia; furthermore, it will focus on how hospitals can be designed to enable family members and carers to provide the continued and consistent support of a familiar and trusted figure for the person with dementia throughout their hospital journey. The findings will be informed by the following: an examination of national and international exemplars and case studies; investigation of key design concepts; and, onsite evaluation at Tallaght Hospital. People with dementia and their families and carers will be consulted throughout to ensure that their needs and preferences underpin the research. 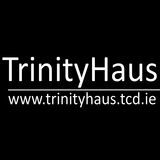 Check out www.trinityhaus.tcd.ie for more information on this project. We will also be circulating further newsletters as the project progresses to keep all stakeholders informed. 5. How well do things like signage, lighting or furniture work, in terms of creating a usable, comfortable and pleasant environment? 4. How accessible, usable or comfortable are the main spaces or rooms that you would typically use? 1. How does the hospital work for you in terms of the hospital location, or accessing the hospital from nearby bus or Luas stops? 2. How easy is it to get onto the hospital grounds? How easy is it to get around, either on foot, or in a car? 3. Is the hospital building itself eay to enter and exit? Once inside is it easy to find your way around or get to where you want to go?